Today was an awesome day for me!!! 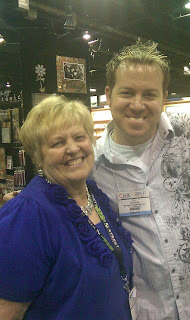 I had my picture taken with Tim Holtz after watching a 2 hour long demonstration by him. I was on the front row of his demo table too! He showed all of his new products including his new Vagabon electric die cutting machine that will be out in October. I learned many new tricks and techniques. He is super fun and a wonderful demonstrator. My favorite booth was Graphic 45. It was gorgeous! The booth and all sales people were dressed in the Alice and Wonderland theme to match their Hallowee'en in Wonderland collection. I can't wait to show you their newest things and everything else I ordered too! Another beautiful booth I spent a lot a time at was Heartfelt Creations! They are wonderful people and so talented! You are going love their newest stamps and dies. What fun!!! I could go on and on about the people I met and the many booths I visited, but I must get to bed. Jon is picking me up in the morning and we are heading up to the Upper UP in Michiagan where I will be getting to gether with many friends. Oh, and I must thank my neice Cathy for keep me on track and in the right aisle or I would never have gotten through the show. She has learrned I get distracted so easy and jump from one aisle to another and then forget where I am. Can you tell we had a great time??? Sounds so good Joan.....you lucky thing you! Sounds like you had a wonderful time, can't wait to see all the new and wonderful stuff! WOW look at you ... Ms. Celebrity with Mr. Holtz! LOL!! That's awesome and I can not wait to hear ALL about it and see your new product!! Enjoy your time in the UP also ... you go girl! You look "gawgeous" dawlin', blue is definitely your color! I can't wait to hear all about your trip and this new machine of Tim's. It's manufactured by Sizzix I believe and will most likely be an excellent product. I have started to build my Sizzix line, you may be enabling me with this one . . . LOL! 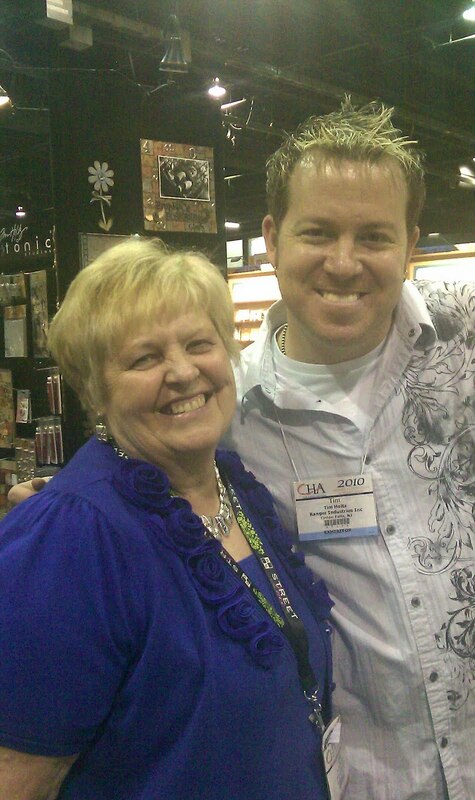 Be safe in your travels, so glad you had a wonderful time at CHA. What an awesome experience! I can't wait to see all the new stuff hit your store!If it wasn't for the dreaded Budget word I would go to the show this weekend. I'm only about an 1 hour or so away! What a gorgeous picture. We can tell you had a wonderful time and we are all so anxious to see your new products. you know now that you ARE going to have to learn how to do videos so you can show us all the cool things you learned!!!! (smile). Have a great time in Michigan. Cool! Joan! Have alwayswanted to hit one of those shows....just as well that I can't. Now that I am retired(end of August) I will have to keep my hands in my pockets and avoid all such temptations...have to admit I have been checking out all the new stuff online....looks like a great years for new AND old favorites.